I am a big fan of Sarah Beth Durst - I really enjoyed two of her books, Ice and Enchanted Ivy. 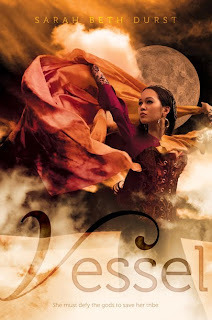 I had high hopes for Vessel, and while it was certainly unique and interesting, I think it's my least favorite out of her books so far. For one thing, Vessel was over 400 pages long. Usually the length of a book isn't a big deal to me - I can zip through a book that long in one day if it's really compelling. But Vessel took me several days to read. I felt like it could have been shortened so it wasn't so long. Some of the scenes in the middle felt like they were dragging along. The characters were very okay-ish. Liyana is levelheaded and clever, but I never felt much emotion for her. She was hard to relate to. Other characters like Fennik, Pia, and Raan seemed like they were just there to add to the plot; their characters never seemed to have much depth. However, I really liked Korbyn, the trickster god. He was the character that really jumped off the page for me. You can't help liking him. He really brings humor to the book and was an amazing character. As I mentioned above, the pacing is really slow, so the plot didn't always have me on the edge of my seat. It all just moved very slowly. The pacing was annoying and made it hard for me to keep my interest on the story at times. But the action picks up in the last quarter of the book, and once I got to that section, I couldn't read the pages fast enough! One thing I wholeheartedly loved about Vessel was the uniqueness. I have never read anything even remotely like it; and I think the unpredictability was what made me continue reading it. Durst definitely has a knack for world-building! The idea of the story is so fresh and interesting. Lastly, one thing that I disliked was the fables that Durst put into the book. A few of the characters often exchanged stories, and every time a new one popped up, I started groaning. Yes, I know the fables were symbolic, and I don't mind a few of them throughout the story, but it seemed like there were way too many fables in Vessel. It got on my nerves after a while. Would I recommend Vessel? Well, if you're looking for a fresh change from the usual YA stories, then definitely try it! But if you want a fast-paced, action-packed, mindblowing story, I'd suggest looking elsewhere. I don't know if you've seen Supernatural, but they have an entire vessel for angels subplot that I love. They have a trickster in it too, who's also fun, so I can definitely see the appeal for that character in this book. Gorgeous cover, too! Ooh, that sounds so cool! I've never seen Supernatural, but it sounds like something I'd love. :D Thank you for commenting and following! !